In the 2nd pAsuram, parAnkusa nAyaki speaks about what some quills would tell on her behalf to emperumAn. Subsequently, since there are lot more quills (a group of them) which can accomplish her objective, she requests some of those to go to her puNdarikAkshan (lotus eyed lord) on her behalf as a messenger. Previously, parAnkusa nAyaki requested some cranes to go as her messenger. Now, she explains to quills what to convey when they go there. She started with cranes but ended with quills. This is how much bewildered she is. That is the greatness of bhagavAn from whom she is separated now. When some one who is separated from worldy matters/experience, they get quite upset and bewildered – if that is the case for normal matters, how much bewilderment one should have when separated from the most distinguished bhagavAn. If bhagavAn does not bewilder her like this, that would be an insult to his most auspicious qualities. inakkuyilgAL – Oh group of quills! nIr alirE – isnt that you who have beautiful voice? en seyyum – what is wrong? agalvathuvO vidhi – Is staying away the right thing to do? Oh group of quills! Isn’t that you who have beautiful voice? When you speak on behalf of me (whom he is bound to) to the greatest lord who has beautiful reddish eyes, what is wrong with that? Due to my previously committed sins, I did not try to perform confidential service at the lotus feet through any means, but still I should stay away? Is that the right thing to do? Here the sweet speaking ability of the AchAryas and their presence in groups is indicated. bhattar was staying in thirukkOshtiyUr and there were 2 sishyas of him also present there at that time. They were named theRkAzhwAn and kOLariyAzhwAn. kOLariyAzhwAn is very focused on AchAram (following disciplined lifestyle according to vaidhika dharmam). theRkAzhwAn is more lenient on the AchAram. Once on a festive day, when they both met, kOLariyAzhwAn asks theRkAzhwAn “Won’t you take a holy dip at least today?” and theRkAzhwAn replies “my sins are so huge that such holy dips are not helpful. Only emperumAn‘s sudharsana chakra have the ability to destroy my sins. So, what is the use of such holy dip then?”. bhattar overheard this and thought “I underestimated theRkAzhwAn based on his AchAram, but he is really knowledgeable” and felt blissful. en – mine. Even in separation perumAL thinks he belongs to parAnkusa nAyaki. Also, it can be explained as just like wherever ones property is, one consoles oneself by saying “this is mine”. Where did she enjoy these aspects? In the first thiruvAimozhi, she experienced/explained emperumAn‘s aiswaryam. 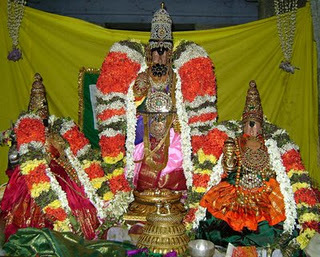 In the third thiruvAimozhi, she experienced/explained his vAthsalyam. Here, union and separation are explained. perumAnArkku – While leaving, he gave her a blissful glance and got her to become fully surrendered to him (in connection with the lotus eyes). en thUthAy – Like the flooding and receding of a sea – it feels so empty. Going as a messenger for me who is so lonely/helpless. en seyyum uraiththakkAl – when you speak on behalf of me, he may even gift you ubhaya vibhUthi (both spiritual and material realms). inakkyuilgAL – you are in a group unlike me who is alone. nIralirE – you are the embodiment of simplicity. Why are you not helping me now? You responded nicely when we were enjoying together. mun – Is there a beginning for the time when I started committing sins? Its anAdhi (beginningless). seytha – Were those sins just planned but not committed? They were committed. muzhu vinai – Were they incomplete in any manner? Can I eliminate? An incident from the life of bhattar is cited by nampiLLai and is explained in detail by periyavAchchAn piLLai in his vyAkyAnam. thiruvadikkIzh – Just like a brAhmaNa, even if he becomes retarded, he will recite vEdham only, nammAzhwAr, even in the state of parAnkusa nAyaki will only want to embrace emperumAn‘s lotus feet instead of his chest – serving the lotus feet is natural for nammAzhwAr. kuRREval – desiring to perform confidential services to the lotus feet. thiruvadikkIzh kuRREval mun seyya muyalAthEn – I who did not try serving your lotus feet previously; It is also explained as said by lakshmaNa in srI rAmAyaNam “kriyathAm ithi mAm vadha” (do as I say), not serving even after hearing the orders. agalvathuvO vidhi – Even after not engaging in self-efforts, would I miss out on the goal? For AzhwArs, emperumAn is the only means. nammAzhwAr says in thiruvAimozhi 5.8.8 “kaLaikaN maRRilEn” (I have no other means”); kulasEkarAzhwAr says in perumAL thirumozhi 5.1 “un charaNallAl charaNillai” (there is no other means than your lotus feet) and in perumAL thirumozhi 5.7 “maiththezhuntha mAmugilE pArththirukkum maRRavai” (Like the crops which only look up to the blackish-huge clouds), poigai AzhwAr says in mudhal thiruvanthAdhi 4 “neRivAsal thAnEyAy ninRAnai” (emperumAn who is the means and goal), periyAzhwAr says in periyAzhwAr thirumozhi 5.1.2 “vizhikkum kaNNilEn ninkaN maRRallAl” (I will not take any other refuge than your blessing vision) and thoNdaradippodi AzhwAr says in thirumAlai 38 “vAzhum sOmbar” (living lazy person – one who only depends on emperumAn for ones protection and will not engage in self-efforts). vidhiyinamE – there is no other way (from our side). piLLai thirunaRaiyUr araiyar says “parAnkusa nAyaki says ‘even though we have nothing in our side to achieve our desires (service to you), why you are hesitating?'”. This entry was posted in thiruvAimozhi, thiruvAimozhi 1st centum and tagged 4000 nammalvar nammalwar thiruvaimozhi vyakyanam pillan nanjiyar nampillai vadakku thiruvidhi pillai vadhi kesari jiyar on July 13, 2015 by Sarathy Thothathri.